DS-2116 Pro DIGIEVER NVR is a true PC-less and 2-bay standalone NVR. It gives a complete network surveillance system with not only remote monitoring but also local display with 1080p Full HD up to 200fps outstanding monitoring performance. DS-2116 Pro is a 2-bay Linux-embedded standalone NVR, powered by Intel performance CPU and performs excellent network surveillance of multiple IP cameras up to 16 channels of single server and up to 256 channels of multiple servers. DIGIEVER NVR supports local display of Full HD quality, remote browser monitoring, multi-layer dynamic E-Map, multi-megapixel recording and smart search playback. The monitoring demands can be satisfied anywhere and anytime by local display monitoring, remote browser monitoring, iOS and Android mobile monitoring. DS-2116 Pro offers 1/3/4/5/8/9/10/12/16/20/25/30/36 & 5+1/12+1-channel & sequential and full screen display modes. DIGIEVER NVR supports video output via HDMI and DVI-I connectors for high image quality local display. Users can simultaneously monitor up to 16 channels in 1920 x 1080 (Full HD) and up to 200 fps (frame rate per second) outstanding monitoring performance. Also, users can control the pan, tilt and optical zoom of IP camera in local display interface. Both monitoring and configuration can be accessed in local display. DIGIEVER NVR lets users search the recorded video by selecting date, time, channel number, normal record, event and recovered file. Users can select a suitable channel from 1/4/9/16 display modes without wasting too much time to search desired images. Besides, users can remotely playback up to 16-channel of recorded videos from multiple DIGIEVER NVRs to easily track the path of moving objects in different locations. 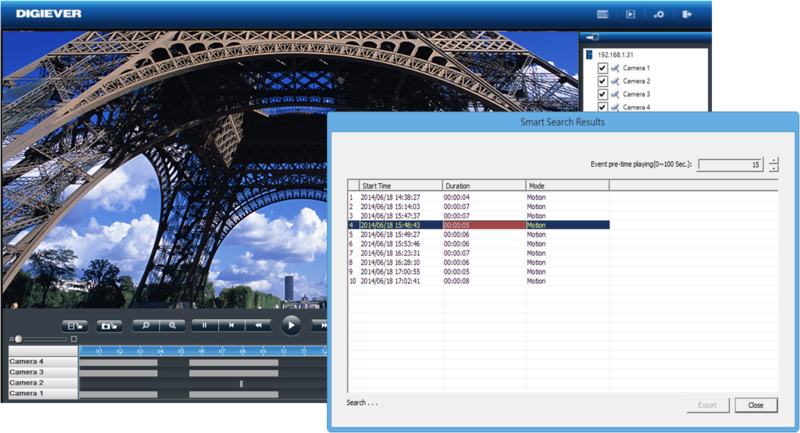 Frame by frame playback and rewind features help users to minimize searching time. DIGIEVER NVR allows exporting video files in AVI format and during playback users can also take a snapshot and save photo in PC. DIGIEVER NVR supports Modbus Analog I/O-Digital I/O boxes to satisfy project requirements where users pay more attention on environment control such as factory and warehouse. Users can name each input and output to desired name and based on the name quickly set up event and action configuration. Users can directly and instantly obtain all I/O boxes’ information and status on liveview without entering configuration page. To ensure the security of confidential videos, DIGIEVER NVR provides diverse built-in backup methods to back up vital recorded videos in different situations.USB backup and USB Type DVD Backup provide users a quick backup solution for emergency situation.Users can set a maximum of days, hours and minutes to backup the latest video files and configure the specific channels for duplication in advance. After setting the time and channels, users just need to press software USB BACKUP virtual button on the NVR and then export the video files to external USB device or USB type DVD burner. When an urgent need arises, video files are backed up efficiently and quickly. For daily backup, Users can routinely backup videos with Remote Backup to NAS server to storage confidential videos for a longer time. When users wants to share some videos to friends or colleagues, Cloud Backup with Dropbox is an useful method to drag the specific video on Dropbox. DIGIEVER NVR is powered by Intel CPU for excellent megapixel recording and provides network throughput up to 360Mbps. 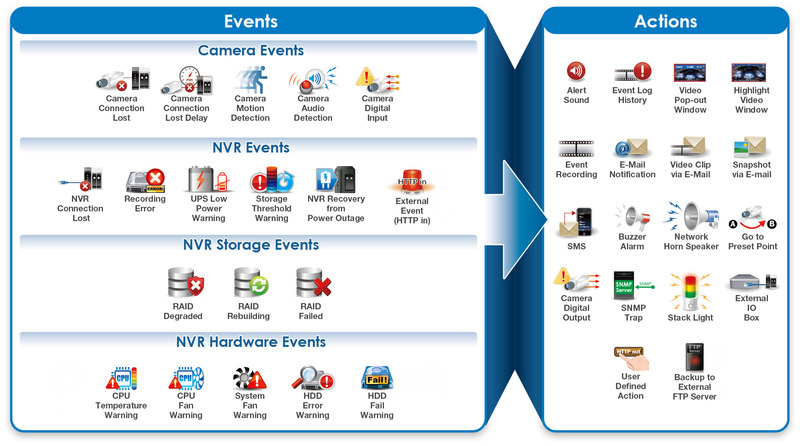 DIGIEVER NVR features S.M.A.R.T (Self-Monitoring, Analysis and Reporting Technology) to prevent video data loss from HDD issues. DIGIEVER NVR also supports each hard disk drive up to 8TB. Through DIGIEVER NVR, users can configure Single, JBOD,RAID0 and RAID1 in local display or web-based interface. DIGIEVER NVR will also automatically recover when power resumes after an outage and recover missing file caused from power outage. By eSATA, users can also connect DIGIEVER NVR toDIGIARRAY, an external storage box, for long-term video storage requirements.